Highway engineers and administrators are continually faced with decisions concerning the design and operation of the highway system. An important part of the decision-making process is the potential impact on the safety of the highway users. Informed decision making requires an understanding of how safety is affected by the geometric design of the roadway, the selection and placement of roadside hardware, the use of traffic control measures, the size and performance capabilities of the vehicles, and the needs and abilities of the users. This understanding can be developed through sound analysis of information about crashes, roadway geometrics, traffic control devices, traffic volume data, and the location of hardware and obstacles on the roadside. These data must be present in computerized files and easily linked so that data can be rapidly assembled and prepared for analysis. The Federal Highway Administration (FHWA) has developed a highway safety database that can meet this need — the Highway Safety Information System (HSIS). 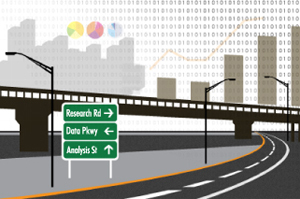 HSIS is a roadway-based system that provides quality data on a large number of accident, roadway, and traffic variables. It uses data already being collected by States for managing the highway system and studying highway safety. The data are acquired annually from a select group of States, processed into a common computer format, documented, and prepared for analysis. HSIS can be used to analyze a large number of safety problems. They can range from the more basic "problem identification" issues to identify the size and extent of a safety problem to modeling efforts that attempt to predict future crashes from roadway characteristics and traffic factors. Download our brochure (PDF, 247 KB) to learn more. The HSIS laboratory is located at FHWA's Turner-Fairbank Highway Research Center. It is staffed by two full-time analysts as well as several graduate research assistants.